I came across a video that made me think about the customer experience…..how can you take the mundane, make one small change, and completely change the way people think about it? As you’ll see in the video below, the goal was to encourage people to take the stairs more often than the escalator. One simple change piqued curiosity and made that goal happen. I recall Zappos making the online chat experience a bit more fun. While this dates back a couple of years, I think it’s a good example of making the customer experience a little more fun. This in turn will make it memorable – people will talk about it, and they will certainly be back. 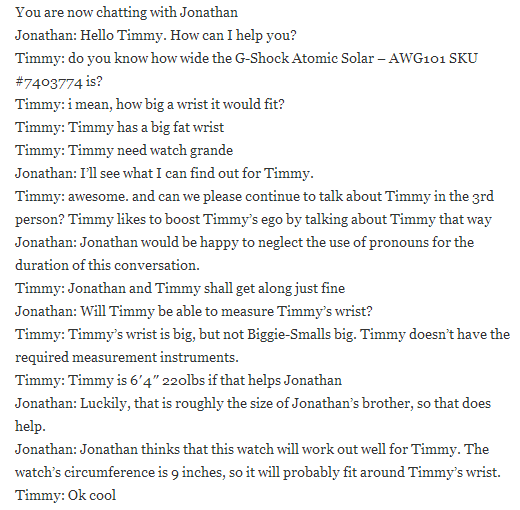 In this case, you can see a snippet of the chat between a Zappos rep and a customer. The customer, trying to have a little fun, was talking in the third person. The rep, without missing a beat, mirrored the customer’s “talk” and they continued the conversation in that manner, all the while serving the customer and getting his needs met. As we go into the new year, think about your customers’ experience when they’re interacting with your staff or shopping. Think a little outside the box to decide what one small change you can make that may make a difference.